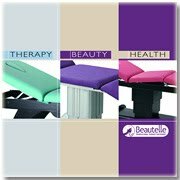 Beautelle Therapy Equipment announces the publication of their new comprehensive product catalogue. Featuring more items, the full-colour catalogue is a complete equipment resource guide for beauty, therapy and health buyers. The latest brochure features some of the brands most exciting ranges of professional therapy and beauty equipment yet, with lots of new items, from a selection of stylish contemporary dark wenge-wood furniture to high-tech electronic tower pedestal couches. They have created more bespoke options and attachments to make your perfect couch and included express manufacture with delivery on certain lines if time is of the essence. Beautelle have also introduced outstanding value lines and put together some new exclusive packages which offer great value for money. Turning the pages you’ll find the products arranged so it’s easier for you to compare and make your choices, including prices, features and dimensions. In this easy to use catalogue Beautelle have also indicated what attachments and options are available for each couch and chair model and you can use their quick reference guide to help you decide which ones best suit your needs. Finally, you can choose from their vast array of upholstery colours featured on their swatches pages. A new–look website complimenting the new brochure has also been unveiled this month with both the issue of precise product layout and better customer navigation in mind. The Beautelle website www.beautelle.co.uk now features a bright new fresh and modern look. Visitors to the new site can now access hundreds of equipment products online including couches, plinths, chairs, seating and trolleys. Beautelle’s Sales Director Sarah Howells said: "We are always looking at ways to improve our website; we decided a complete design overhaul was needed to enhance our customer's online shopping experience. The improved product information pages and order online checkout process are just a couple of features on our new website. Hopefully the changes we have made will help our customers to source with us their perfect equipment solution."